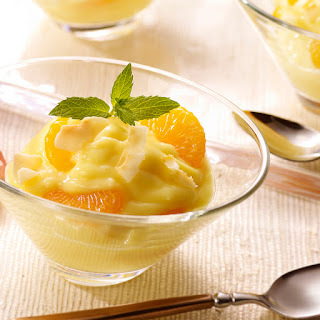 Direction Stir in mandarin oranges and coconut. Spoon evenly into 6 dessert dishes. Direction Refrigerate at least 1 hour before serving. Store leftover pudding in refrigerator. Combine orange juice and 2 tablespoons reserved juice in small saucepan. Heat until simmering and add gelatin. Stir to dissolve and remove from heat. Chill gelatin mixture until slightly thickened (consistency of egg whites). Direction Fold in mandarin oranges, whipped topping, and yogurt. Line side of 8-inch springform pan with cookies. Spread filling into pan. Cover; chill for at least 3 hours.